The 204K and 304K models feature rigid front and rear axles to meet the 8-foot height limit while lowering the center of gravity and increasing stability and the tipping-load limit. The models are designed to work in areas with restricted access, such as door and trailer openings. The 204K operates at 59 horsepower (hp), and the 304K operates at 64 hp. Each model's diesel engine is an interim Tier 4 unit and includes a two-speed transmission with a top speed of 12 mph. 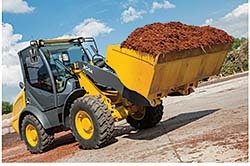 A skid-steer- style coupler enables operators to attach and release Worksite Pro™ attachments without tools or leaving the seat.